What Is DA Form 1574-1? DA Form 1574-1, Report of Proceedings by Investigating Officer is a form used within the U.S. Army for documenting the facts of an investigation, presenting its findings, and giving recommendations for after-investigation actions. The appointed Investigating Officer (IO) completes the form, ensures that all data is correct and submits the form to the appointing authority that assesses the gathered results. The form - sometimes confused with the DD Form 1574, Serviceable Tag - Materiel - was released by the Department of the Army (DA) in April 2016 with all previous editions obsolete. An up-to-date DA Form 1574 fillable version is available for download below or can be found through the Army Publishing Directorate website. The DA 1574-1 is a part of the DA Form 1574 series along with the DA Form 1574-2, (Report of Proceedings by the Board of Officers). The DA 1574-2 is used by an appointed Board of Officers for recording investigations and reporting them to the appointing authority for review. 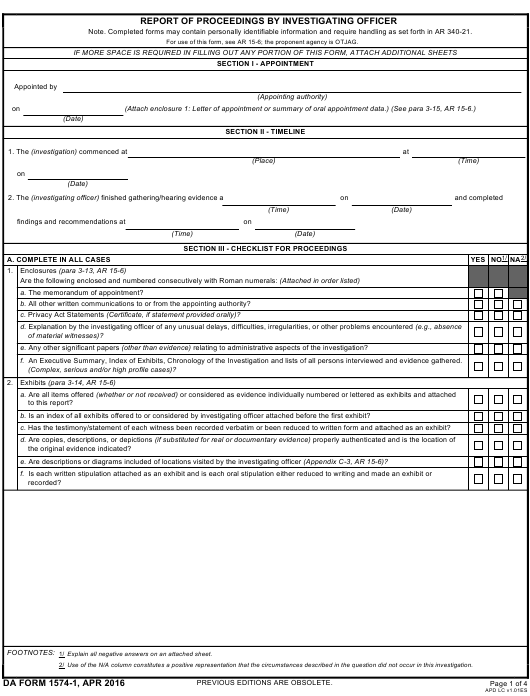 How To Fill Out Da Form 1574-1? Note. Completed forms may contain personally identifiable information and require handling as set forth in AR 340-21. For use of this form, see AR 15-6; the proponent agency is OTJAG. a. The memorandum of appointment? b. All other written communications to or from the appointing authority? c. Privacy Act Statements (Certificate, if statement provided orally)? e. Any other significant papers (other than evidence) relating to administrative aspects of the investigation? f. An Executive Summary, Index of Exhibits, Chronology of the Investigation and lists of all persons interviewed and evidence gathered. (Complex, serious and/or high profile cases)? b. Is an index of all exhibits offered to or considered by investigating officer attached before the first exhibit? c. Has the testimony/statement of each witness been recorded verbatim or been reduced to written form and attached as an exhibit? e. Are descriptions or diagrams included of locations visited by the investigating officer (Appendix C-3, AR 15-6)? Explain all negative answers on an attached sheet. Use of the N/A column constitutes a positive representation that the circumstances described in the question did not occur in this investigation. THIS REPORT OF PROCEEDINGS IS COMPLETE AND ACCURATE. Procedural guidelines and additional information can be found in the Army Regulation 15-6 (Procedures for Administrative Investigations and Boards of Officers) released in April 2016. DA Form 1574-1 instructions are as follows. Section I identifies the authority appointing the investigation and provides the date of appointment. Section II lists the key stages of investigation and provides the beginning and end dates for each stage. Section III contains a series of questions that need to be answered during the investigation procedure. Section IV is for presenting the information gathered during the investigation and reporting its results. Each paragraph must relate to one evidence-based conclusion and answer a single question raised in the memorandum by the appointing authority. Section V lists the IO-given recommendations. The IO certifies the information provided on the report by signing Section VI. Section VII is completed by the appointing authority. The appointing authority will examine the facts, findings, and recommendations and approve the report (with or without modifications) or return the report for corrections. Incomplete, ambiguous, or erroneous reports will be returned to the IO to be revised.